When a business looks at how to approach the U.S. Hispanic consumer, it is quite easy for it to rely on commonly known facts: Family is important to them, their households are larger, and they over-index usage of mobile devices to gather information and shop online. Let’s not forget that they love soccer – and are deeply religious. However, to develop the most meaningful connection, it’s essential to dig a little deeper than the obvious. The same analytical rigor and behavioral curiosity we apply to our core US consumer (also known as the general population) needs to be involved in studying the Hispanic consumer and how they relate to your category. First, we’ll begin with an examination of the data, then uncover insights to understand what truly matters to this exquisite target. 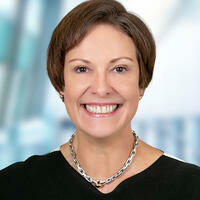 One of the most exciting realities about Hispanic consumers today is their growing complexity. Examining several data sources will help us paint a complete picture. First, we need to look at where they come from. 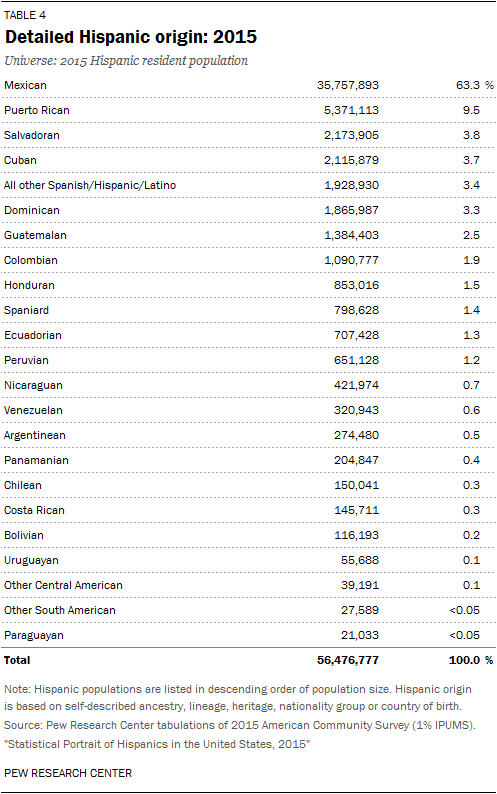 The U.S. Hispanic population is drawn from an increasingly diverse mix of countries. Latin America is vast and harbors many cultures, including some that may be more attuned and open to your product and service offerings than others. It’s important to have a profound understanding of their culture of origin to successfully make them your core target. Mexican Hispanics accounted for 63 percent (36 million) of the nation’s Hispanic population in 2015, by far the most significant share of any origin group. Puerto Rican Hispanics, the second-largest origin group, stood at 5.4 million in 2015. Five other Hispanic origin groups have populations of more than 1 million – Salvadorans, Cubans, Dominicans, Guatemalans, and Each has also seen its population increase over the past decade. Since there is power in numbers, including market size and market potential, we should also look at where they are settling in the US. By picking a geography where your core target is active, you will have a greater chance to succeed. 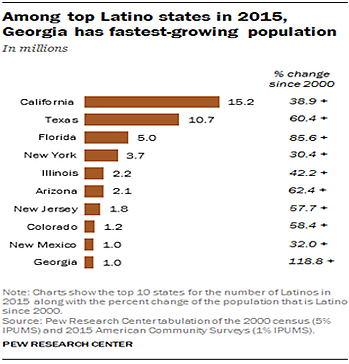 Georgia’s Hispanic population has more than doubled since 2000, the fastest growth among the 10 states with the largest Hispanic populations. California continues to have the largest Latino population among states, but Texas is seeing a faster growth rate. In 2015, 15.2 million Hispanics lived in California, a 39 percent increase from 10.9 million in 2000. Yet Texas has had even more rapid growth, with its Hispanic population increasing 60 percent over the same period, from 6.7 million in 2000 to 10.7 million in 2015. The next step is understanding Hispanics’ peculiar shopping behavior. Not only do they shop differently, but there is also a growing sophistication they have about selecting products and services. This finesse is a direct result of greater choices in media, as well as steady improvements in their socioeconomic status. Last but not least, Hispanics from all origins in Latin America value experiences over promises. What you tell them is not as trusted as much as what you show them. Delivering experiential marketing across categories is the best way to win US Hispanics’ heart and brand loyalty. If you get embedded in their day to day life in small but meaningful ways, you will go the distance. Try sponsoring local soccer teams and teaching classes in schools where Hispanic kids attend. 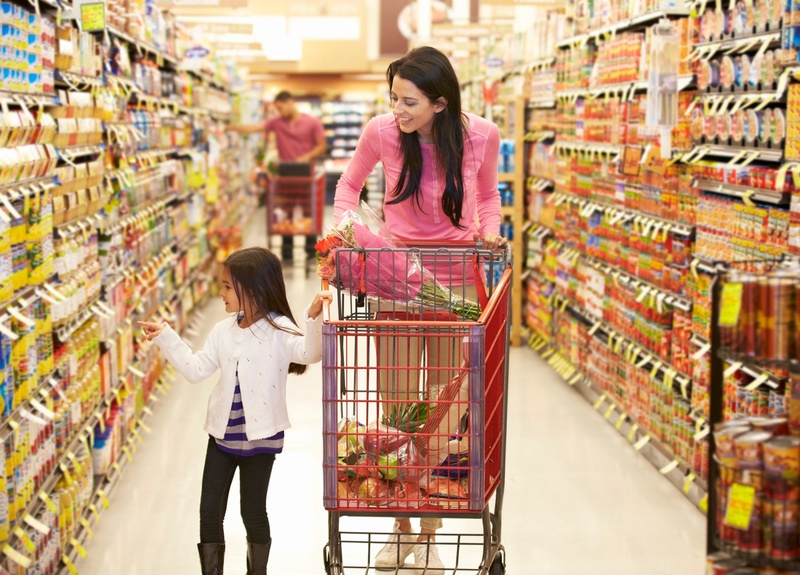 Instead of merely sampling at the supermarkets, invite them to touch and interact with your product. So, what else can you do as the CEO of a company trying to grow your business is US markets with a strong Hispanic population? Apply the same rigor and curiosity to your Hispanic target consumer as you do to the general population. As you see above, there are many reliable sources of data to assist you. Leverage particularly strong affinity aspects your business may have with Hispanic consumers – and tap into the core cultural values of their country of origin. Embrace a “show me, don’t tell me” engagement strategy. Build programs with retailers, distributors, or in your facilities, to create meaningful experiences. By combining the knowledge in this article with the analytical information most relevant to your business and its goals, you will discover strategies for leveraging your core target group’s demographics and behavior, build long-lasting relationships, and garner enthusiastic brand advocates.